Our new product is released at DAZ: EJ Valeria is a character for Genesis 3 Female(s), that includes Iray materials (in addition to the traditional DAZ Studio's 3Delight ones). She includes several custom sculpted morphs: head morph, long sorceress nails, square nails, fangs, and genitalia, all usable with Genesis 3 Female Base. The body uses Genesis 3 Female Body Morphs. Valeria has a specially detailed skin, including skin features like pores, moles and variations found in human skin that will give you the quality you need for the new generation of NVIDIA Iray renders. 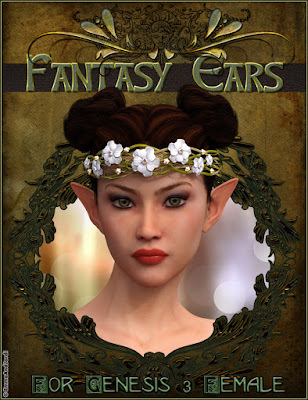 Our new product is released at DAZ 3D: EJ Fantasy Ears For Genesis 3 Female(s) is a collection of 20 ear morphs to get Genesis 3 Female(s) directly in the realms of elves and magical creatures. A must have for any fantasy render! You get 20 carefully sculpted in Zbrush ears, for elves, fairies, pixies, orcs, fauns, and all kinds of fae folk. EJ Fantasy Ears can be used with any hair, because they only modify the geometry of the ears, respecting the rest of the head, and they don't deform the hair or any other headwear. These morphs work on Genesis 3 Female(s), and all figures based on her.